wow, the tone difference is crazy! i love them both though! hmmm, I love the film one here but they're both great! don't know about insurance... but i dig these side by side comparisons. My preference is for film. 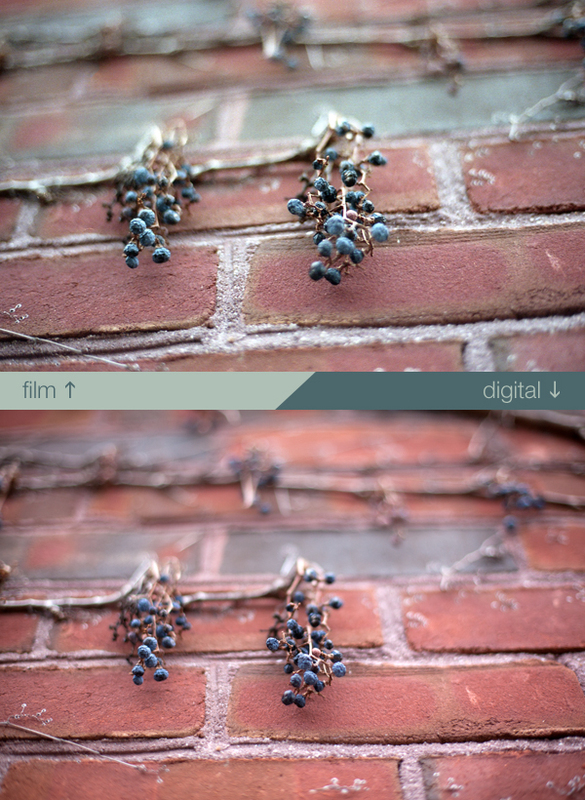 Digital, much as I love it, has saturation issues that take a little extra effort in Photoshop to correct. I only have a digital camera right now and this is my constant complaint. But then a proper course in digital photography (and Photoshop) might help me with that. Both photos are beautiful, though. Look into Squaretrade . 3Yr warranty covers $700-$800 for about $95 . Not too familiar with them but they have pretty good reviews. both are so lovely. though, I think I prefer the...no, wait, my mind keeps going back and forth as to which I prefer. So, I shall settle on loving them both. When will you post about your new new lens toy? I am curious about it! I have to say I prefer the first one, so the film! can I ask you how you transfer your films on the pc? I shot in film too and I use a scanner for diapo (slide), but the quality is not so good. I also ask for the digital copy when get a film developed in the shop.. but there is a long long waiting time!!! I cover my equipment with my homeowners insurance - you can up the coverage beyond the standard to fit the pricing of your goods. Renters insurance works the same.